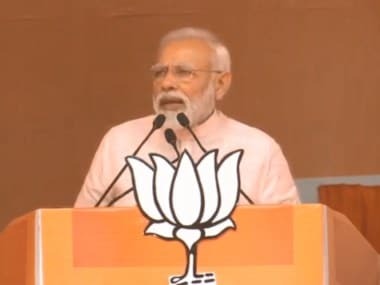 Four crore out of 25 crore families do not have power connection even after 70 years of independence, says Modi. Modi says they are the first government to launch the maximum number of schemes for the poor. "We are the first to think of women who become victims of pollution in the kitchen," says Modi. "We're certain of victory in 2019. And we're certain of building a 'New India' by year 2022," says Arun Jaitley while addressing the BJP National Executive meeting. "Corruption and elimination of black money was never on UPA's agenda in 10 years. So it's obvious our efforts to do so wouldn't have the support of UPA leaders. Those on the receiving end of our government's anti-corruption stance are uneasy," says Arun Jaitley. Arun Jaitley, elaborating more on what Narendra Modi said at the BJP National Executive meeting, said the Prime Minister wants the BJP to focus on public participation, as it would help eliminating corruption and terrorism. Prime Minister Narendra Modi will soon address BJP workers at the National Executive meeting. "In Kashmir, we have inaugurated Rs 40,000 crore worth of projects. We are also focussing on developing infrastructure in the Naxal-hit areas. Development will deter terrorists in all these regions," Union minister Nitin Gadkari has said. Senior BJP leader and Union minister Nitin Gadkari said India's relations with foreign countries have been improving. "There were disputes between India and China. But Prime Minister Narendra Modi successfully resolved the issue and tensions on the border was resolved. Similarly, we also wish for friendship with Pakistan. This is the reason Modi broke from protocol to meet Nawaz Sharif in Lahore in 2014," he said. Updating the media on the ongoing BJP National Executive meeting, Goyal said, "The steps that this BJP government have taken from Day 1 have always ensured that we work towards a corruption-free environment. Demonetisation, pulling up benami properties, shutting down shell companies among other measures, were some of the big steps undertaken by us." "Our party has criticised Congress Vice-president Rahul Gandhi's statements in Berkeley University, where he said that our country was running on dynastic politics. BJP has always worked on politics of performance. We are working for the poor. We strongly object to these statements, so does the nation," says Piyush Goyal while elaborating on Amit Shah's speech at the national executive. The slowdown in economic growth, the lack of jobs, a stimulus package to kickstart the economy and the next round of assembly polls are on top of agenda for the BJP leadership. The BJP leaders are expected to discuss ways to strengthen its base in states like Odisha and West Bengal, where the party didn't fare too well in the 2014 general elections. At least 1,400 MLAs, 337 MPs and all MLCs, besides its core group leaders from the states, are among those expected to attend the meet on Monday. The national executive meeting is expected to dwell on ways to expand the party base in states. The BJP leaders will discuss ways to increase the numbers using the tools at hand, like the welfare schemes announced by the NDA government. 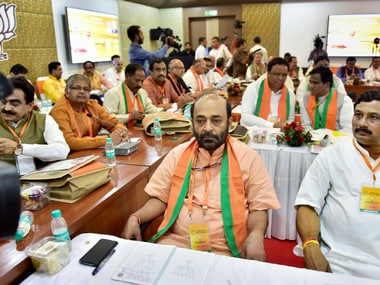 On Sunday, BJP chief Amit Shah took stock of BJP's performance at its national executive meeting that will conclude with Prime Minister Narendra Modi's address today. He is expected to counter the opposition's criticism of the state of the economy. BJP leaders, Union ministers, state chief ministers, party president Amit Shah, Prime Minister Narendra Modi inaugurate the national executive meeting at the Talkatora Stadium. Among those present on the stage are: veteran BJP leaders LK Advani and Murli Manohar Joshi, Amit Shah, Modi, Rajnath Singh, Nitin Gadkari and a host of other central ministers. Uttar Pradesh Chief Minister Yogi Adityanath and Rajasthan Chief Minister Vasundhara Raje are also present on the stage. 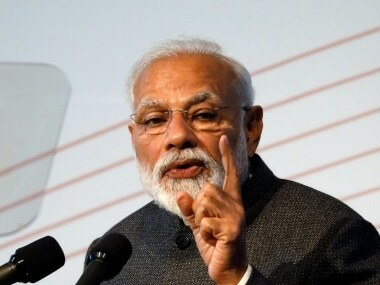 Prime Minister Narendra Modi is expected to chalk out the Bharatiya Janata Party's (BJP) strategy for the upcoming Winter Session in his address to the BJP national executive. An important feature of Monday's meeting will be that Modi's speech will be broadcast live: a rarity as most national executive meetings are closed to cameras. More than 2,000 delegates will attend what has been described by senior party leaders as an "extended national executive" to mark the end of a year-long exercise to commemorate Deen Dayal Upadhyaya's 100th birth anniversary. With the Opposition parties attacking government's handling of the economy by citing the fall in GDP rate and demonetisation figures, Modi is expected to take them on and highlight his dispensation's "successes" in boosting transparency and curbing black money. BJP president Amit Shah on Sunday took stock of the party's performance at its national executive meeting that will conclude with Prime Minister Narendra Modi's address, in which he is expected to counter the Opposition's criticism of the state of the economy. discuss on 25 September, the birth anniversary of Hindutva icon Deen Dayal Upadhyaya. During the office bearers' meeting, Shah reviewed the performance of the party's expansion drive in the last one year. development measures initiated by the government, party general secretary Bhupender Yadav said. It was also decided to take forward prime minister Modi's 'Swachh Bharat' mission and the resolve to establish a 'New India' and make them a success, he said. General Secretary Vinay Sahasrabuddhe also shared the details of Shah's country-wide tour during the meeting and said the party chief travelled 50,000 km and interacted with 18,000 workers across the country to strengthen the BJP. To mark the birth centenary celebrations of Upadhyaya, the party has also dedicated the year to the 'welfare of the poor' and the government has taken various initiatives on this front while curbing corruption, Yadav said. A key highlight of the meeting will be the presence of the party's elected lawmakers -- close to 1,400 MLAs, 337 MPs and all MLCs, besides its core group leaders from states among others on Monday. transparency and curbing black money, party sources said. 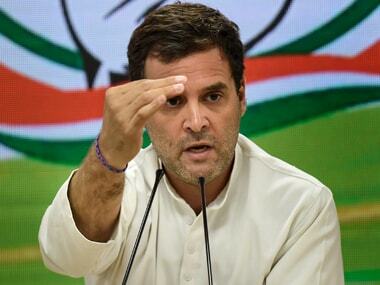 Congress vice president Rahul Gandhi has consistently attacked the government over the economy during his visit to the US. The prime minister's agenda of development is also expected be a key feature. A senior party leader said the issue of Rohingya immigrants, whom the government has termed a threat to security, may also find a mention.